All our labels and placards conform to BS 5609 standards for pressure-sensitive, adhesive-coated labels. √ Labeline price match this product with comparable compliant standards. √ Order before 2.30pm – Shipped same day! √ Standard next day delivery (see SHIPPING below). We test our labels over the year at our Business Park Marina (samples after 11 months in tidal saltwater and drag test). Clients are responsible for VAT and/or Duties. When you purchase Class 1 Explosive 1.4G Hazard Warning dangerous goods placards you should check and test that they comply with BS5609 specification and regulation standards. At Labeline we test placards at our tidal salt water Estuary location. Not only do we submerge labels for three month but many more months after that, we check coatings for drag testing, exposure to full South facing UV sunlight and daily weather conditions. You should be aware that if labels are non compliant then the containers, vehicles or package could be impounded, held at boarder controls, face fines or convictions all of which can create unnecessary costs. The signed documentation that accompanies your dangerous goods placard is likely to be completed by an employee who is then legally responsible for that shipment. 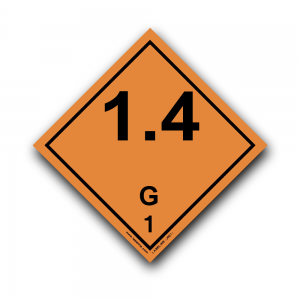 You need to ensure your dangerous goods packaging, inner packaging, DG placards and documents comply with international regulations and standards. 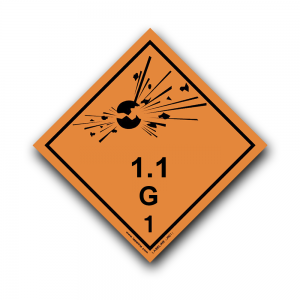 At Labeline all our labels and placards comply with the strictest DGR regulation standards for IATADGR, ICAOTI, IMDG & ADR so you can be assured that our labels and placards comply with all modes of dangerous goods movements. Labeline is not just a bookseller or printer we are the key dangerous goods specialist to industry and have been so for the last 25 years. We are IATA’s best performing regulatory distributor worldwide (for more than 10 years), providing a fast international service, maintaining over one million labels in stock, from hazard labels, packaging labels and placards, normally dispatch the same day you place an order. Our customers purchase in confidence as our DG products are used by many 1000’s of multi-national companies and industries worldwide including most of the footsie 500. It’s Dangerous Goods don’t risk non compliance.